With the perfect locale, the oceanfront Bay Watch Resort features one-, two and three-bedroom units with private balconies, fully equipped kitchens and spacious living rooms. 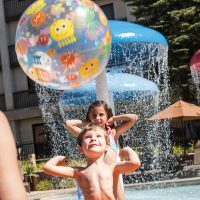 Families will love the wide range of amenities including onsite dining, pools and water fun and an onsite game room. Throughout the summer, Bay Watch Resort provides daily activities for kids including poolside games, arts and crafts, sand castle competitions, beach kickball and soccer, scavenger hunts and much more. 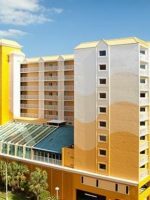 A wide variety of activities and attractions are also nearby such as Broadway at the Beach, the Myrtle Beach Boardwalk, boating tours, water parks and amusement parks. With one-, two- and three-bedroom units there are plenty of family-friendly rooms available. All suites include private bedrooms and bathrooms, a spacious living room, sleeper sofas and free Wi-Fi. There are TVs in each of the bedrooms as well as the living room. The spacious, furnished balconies can be accessed through the living room and master bedroom. 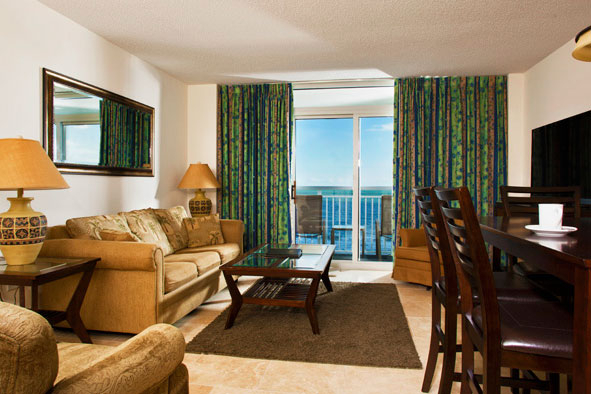 For the best sweeping views of the beach and ocean, request an oceanfront room. Each unit offers a fully equipped kitchen with dishes, utensils, a stove, microwave, and fridge. These roomy kitchens allow families to cook or enjoy snacks after a long day of activities. 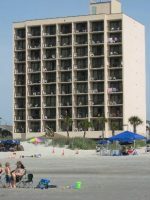 Bay Watch Resort offers several unit floor plans, accommodating families of all sizes. Rooms can accommodate anywhere from four to 14 guests. My stay at the Oceana Resorts was a serene experience especially during the earliy morning at the Bay Watch Cafè. I had my cafè by the bay window with an AWESOME ocean view. MOST of all was the great service Kimberly Whitacre provided. She was very personable and a great listener! I truely enjoyed conversing with her and I shall return! With more than 10 indoor and outdoor pools, lazy rivers and Jacuzzis your water babies will be fully satisfied with this water sanctuary. 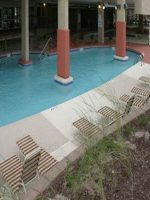 Grab a tube and hit the lazy river, take the kids to splash around in the separate kiddie pool with a spouting water tree or relax in the Jacuzzi. Kids can grab their buckets and shovels and get ready for a fun-filled day of sandcastle building and shell collecting at the beach. The vast white-sand beach is just steps away with an easy access boardwalk from the pool area. Kids and families can sign up for this Monday through Saturday program which offers all sorts of fun activities, like mermaid training, drum line, magic show, pool games, bingo, beach bowling and family trivia. Most of the activities are free for guests however a few specified activities require a fee. Bay Resort offers three onsite, casual dining options. The Fishtails Beach Bar is perfect for a quick bite to eat. With a family-friendly atmosphere and beachfront dining, relax by the ocean and enjoy the local cuisine. The menu features mixed green salads, cheeseburgers, sandwiches and wraps. Enjoy live entertainment, music and karaoke nights. 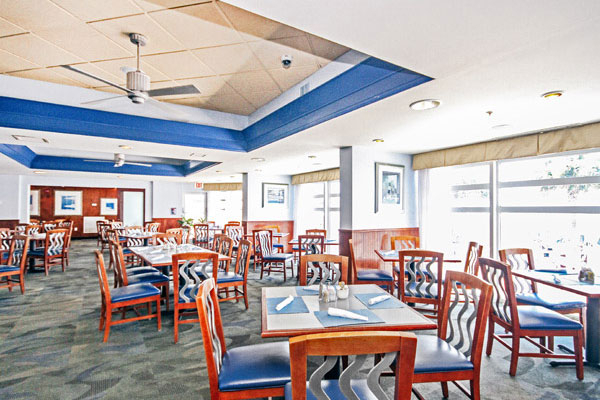 Start the day off right with a mouth-watering breakfast at the Blue Bistro. Families will enjoy signature breakfast entrees ranging from bacon and eggs to pancakes, sausage. Breakfast is served daily. The Blue Bistro is also open for lunch and dinner, serving up a wide range of dishes from pastas and salads to chicken entrees and sandwiches. A special kids' menu offers chicken fingers, macaroni and cheese, popcorn shrimp, pizza and grilled cheese. All kids' menu items are served with French fries. This is the perfect place to catch the big game and grab a cocktail as well as an ideal place for families to grab a bite to eat. The blue crab dip and the cold water shrimp cocktail are excellent starter options. A large selection of sandwiches are available including burgers, chicken sandwiches and prime rib sandwiches. The Little League kids' menu features grilled cheese and fries, pizza, chicken fingers and hot dogs. Daily drink specials are available as well as free hors d' oeuvres. 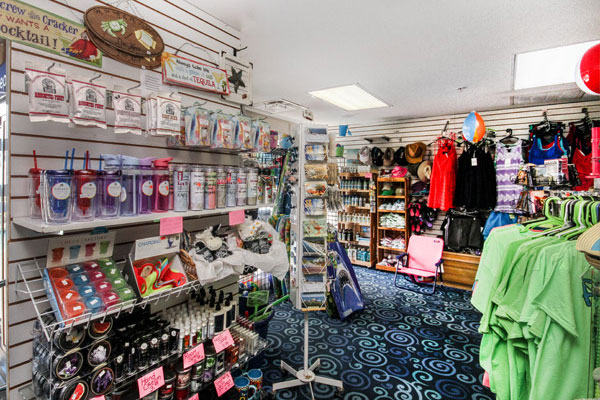 The onsite convenience store and gift shop is a great place to pick up any items you may have forgotten. 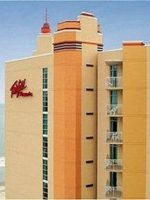 For families planning to visit Myrtle Beach, the summer months are the best time to vacation. 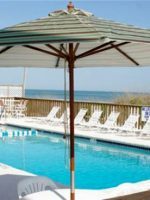 With school out and much time to spare, families can enjoy all Myrtle Beach has to offer. After Labor Day, golfers flock to Myrtle Beach resorts in search for some of the best courses around. If traveling by car better suits you, the Bay Watch Resort offers guest parking. Local bus service is available by The Coast RTA with transportation to and from major thoroughfares and neighboring towns. Several car rental agencies, taxi's and limo services are also available to take you where you need to be. The Awakening Spa at the Anderson Ocean Club & Spa offers mom and dad some rest and relaxation. The full-service day spa offers a variety of rejuvenating treatments and services including mineral baths, massages, body wraps and facials. Couples mineral baths and massages help relax and unwind muscles side by side.